At EverLine Coatings we offer a number of interior line painting services to businesses in North Bay, Sudbury and the surroudning areas. These services include safety and production flow floor markings, plant and warehouse forklift traffic line markings and parking garage and parkade line painting. 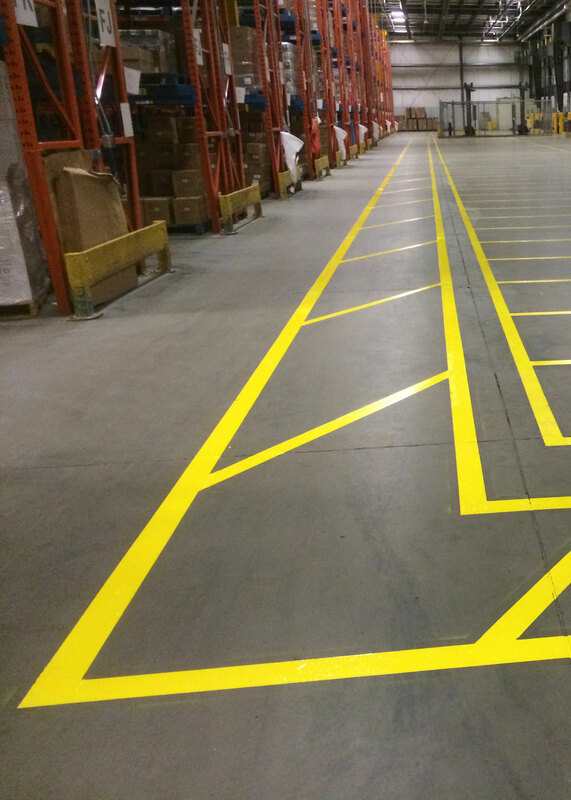 At EverLine Coatings and Services, we fully understand that having accurate and durable line markings inside of a warehouse or commercial building is imperative to everyday operations and the safety of employees. We offer a wide range of interior line painting services to North Bay, Sudbury and the surrounding areas and can easily complete any line painting project that you need. Our experienced painters have been painting warehouses and commercial buildings for decades. Whether you need a simple repaint, improve an existing layout, or plan an entirely new one, we can help. We’ve completed a variety of line painting projects of all sizes and for different uses in the past and can consult you in the designing of a line schematic. When you choose Everline Coatings and Services for your interior line painting needs, you get the Everline advantage. Everline has invested a lot in training it’s crews so they have needed skills to can take on any job. We deliver durable line painting services with precision and care. We’ve paired our industry leading interior line painting services, with the best customer service in the industry too. Our commitment to providing you a service that cannot be matched by competitors is proven with the flexible hours available with our line painting crews. We understand you can’t disrupt your regular business operations with interior line painting crews and waiting for paint to dry. This is why we are proud to offer overnight and off hours line painting services. Our crews will come in and complete your line painting project while your business is closed for the day. At EverLine Coatings and Services, we are considered line painting experts from our many. This comes from the fact we’ve been proudly serving our happy customers for decades. 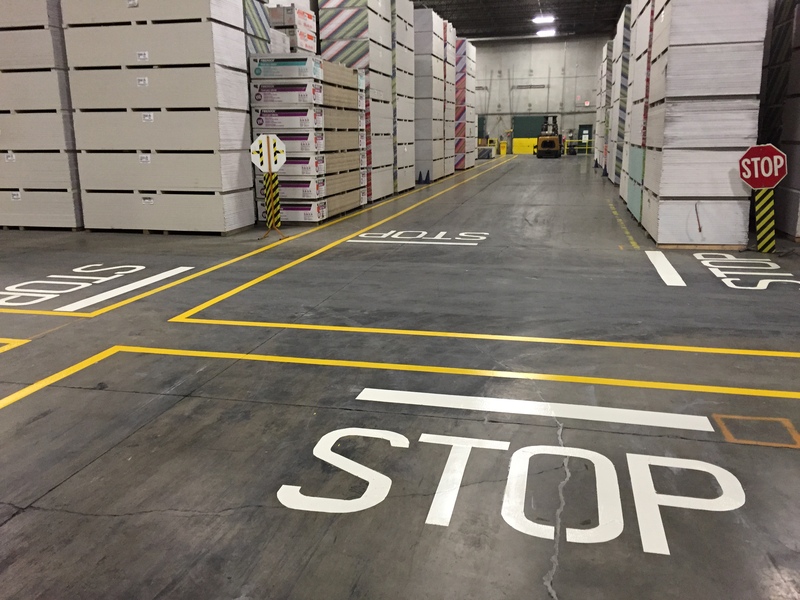 We understand that floor markings and forklift traffic line markings must be strategically implemented to ensure safety and efficiency. Our experience comes from completing various interior line painting projects using products ranging from paint to epoxy and even urethanes. Our unmatched experience providing interior line painting solutions allows us to provide the right solution for each unique type of facility and surface. We will provide your business with the appropriate products based on your unique budget, find a working time window for your business and will meet your durability expectations. Our multiple crew approach enables us to work quickly and efficiently to ensure minimal on no disruptions to night or day operations. If you will be receiving our interior line painting services in the new future, there are a few steps we ask you to undertake to prepare your facility before our crew arrives. The safety of our crews is our top priority. If you require assistance in cleaning the surface before painting, please inquire about our cleaning services. Following these steps will ensure a safe, effective and timely completion of our services so we can serve you better.